Oil and Wax has the same citrus base as orange oil with the addition of natural beeswax. 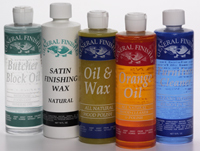 Its recommended use is on Danish Oil finishes that do not employ a surface sealing finish. The oils will penetrate into the wood while the wax seals the surface, maintaining a beautiful, rich luster.